Find all the hardware you need to build a top-quality bimini bow frame with these ready-to-assemble kits. 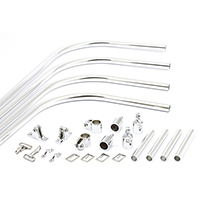 Die-cast chrome hardware make these bimini top frame parts durable and marine-ready. Aluminum tubing means the frames are lightweight for easy assembly. Use to make custom boat tops or for resale. Just pair with a premium marine top fabric for a complete bimini top. Choose from 2-bow and 3-bow bimini frame kit options below.